Why quote writing? My passion! Wash off the dirty words of men over you and wear your apparel of uniqueness. Aside God, the captain of every life is the individual itself. Men may say different but you alone know the right words that best describe you. I grew up from a separated home, so I didn’t really have the love a mother and father gives to a child. In my primary three (3), I settled in with my maternal grandparents. There were more ladies in the house so I felt adapting won’t be a problem. I also felt my maternal aunts and grandparents were going to help bridge the gap of that parental love I lacked, but it turned out to be a different story. Though my aunts never hated me, but their utterances towards me were never pleasant and positive. They always described me as ugly, arrogant and treated me as though I wasn’t as good as them. Their attitude impressed a negative psychology in me, having the feeling of abandonment and distance. As such, I grew up always angry and unhappy. Every day, I lived by their description of me. I would lock myself up in the room and cry, with the hope that the burden would be lifted, as well as questioning God why He created me to such family. I developed hatred and jealousy for females who looked so beautiful and condemned myself as the unfortunate. I was astonished at such positive description inclusive of me and was curious and eager to hear more. So, I walked up to him and told him my predicament. He spent time, further explaining to me God’s notion of beauty and worthiness as contrary to antics’. He also recommended books for me to read and asked me to sing the hymn continually to myself. His words kindled up a little life in me so I decided to exercise his recommendations, making the hymn my favorite and also collecting some of the books. Consequently, I became exposed to individuals like Joyce Meyer and Oprah Winfrey and realized that I was none of those ill descriptions of people. A further turning point was the realization that I could change the effects of those ill words on me. I then took the decision to avoid being exposed to such negativity by picking to stay in environments where positivism reigned supreme, also to acquaint myself with individuals and programs that are so structured. That seed of attraction to books Mr. Ina deposited in me grew in leaps and bounds. While quotes and motivational books naturally took a better part of me, indeed, one of my uncles took it upon himself to supply me quotes books. Quotes created the ambience I longed for as a growing up child in my circumstance; confronting me with the right words that made me get nice and feel positive. The passion to be a quote writer thus fueled up in me. As early as my Junior Secondary School (JSS2), I started writing quotes, most of which then were copied from others. I guess, it was in a way, lending my little hand in helping to curb the devastation and hurt that accompanied my kind of experience in the society. Coincidentally, the indulgence of my age mates afforded me a platform every evening where I read my quotes for them. Though, the forum was driven by my passion, the associated fun was not just for me but my play mates also because they always looked forward to it every evening. Little by little, that shy, angry and ugly girl as it were, evolved to a beautiful, bold, happy and purposeful lady. So, I became fully convinced how peripheral those ill descriptions were and also decided to help liberate as many people (especially females) in the same condition as I used to be, through my message of love and the uniqueness of self. Starting with my age mates at home, in the church and school with the ones that were taunted and labeled as idiots, fools etc. to get dissuaded from suffering that inferiority complex. Gradually, my associates became more of whom society characterized as low and I was becoming more effective on seeing them act towards my advocacy: More so, as I was appointed to so many lead roles in virtually all activities that concern my age range in the church, my activism got stronger. A significant testimony that motivated me the more was In the year 2010, when I enrolled for extra mural lessons, preparing for the Joint Admissions and Matriculations Board (JAMB) Examination, I met a girl by name Silvia whose height (her short nature) was embarrassing to her. She lived in shame due to it and was afraid of any gathering. As it were, we became friends and I recommended few books for her. 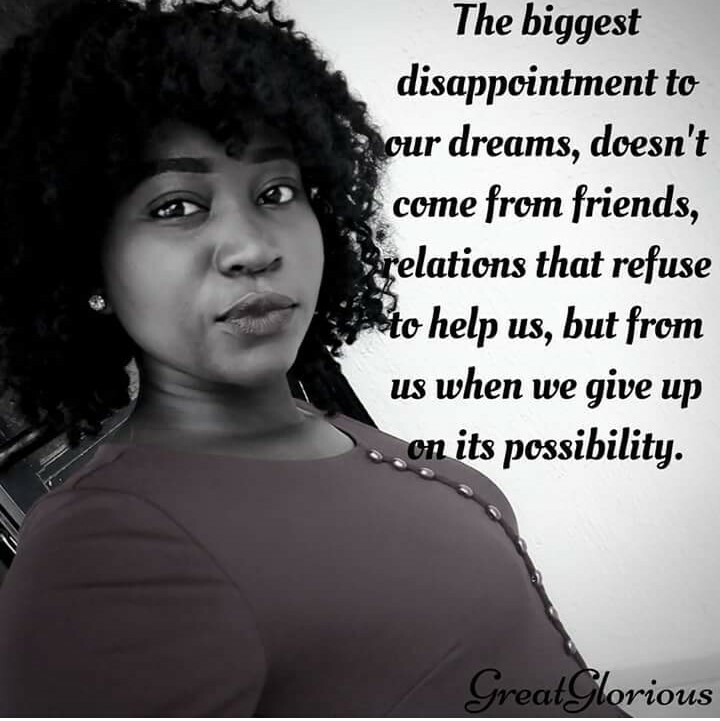 As at when we were sitting for the Joint Admissions and Matriculations Board (JAMB) Examination, which was an interval of six months, she had been able to build confidence believing she was unique in her own way. As a University undergraduate, I had compiled over hundred quotes, which were subsequently posted to as many people as I could reach through different social media platforms as inspirational good morning messages. Over the years, I have come to the realization that one major cause of failure in life is acceptance of stigmatization. The fact remains that every individual is imperfect and therefore needs encouragement to make the best out of life; as a matter of fact, we have all in one way or the other suffered such abuses. Yes, the phenomenon is general, but the impact on the individual differs and unfortunately results to wrong decisions, lifestyles, attitudes etc. in some people of which the outcome denies them of truly living life the way they ought to. Indeed people have the privilege to say things (right or wrong) about you but the truth remains that you alone can prove the real you by taking conscious steps in maximizing your God created person. Be in absolute control of your environment, as no one can make you feel inferior without your consent. Do not condescend; rather be discernible enough to attract efficiency as that is what God created you for. Always, engage yourself in things and with people that shall bring forth success throughout your life. Thank God, I was guided to this understanding and aided to deciding to have absolute control of my life. Today, I have written over four (400) hundred quotes with series of testimonies from individuals known and unknown of how it has blessed and changed their perceptions of life for the better. I have also featured in so many programs to speak or share my story with them. Life is best enjoyed when we live as our true self, never for a second let people make verdicts over you, control you, lead your life (career, relationship, marriage, business, finance etc.). When you live for yourself and pursue a purpose, you not only become great and successful but also find true happiness, peace and joy. The reason many live in depression and sadness is because they spend their time trying to be like others. Allowing people’s perceptions to control you brings no good, stop living in the grip of others. Finding your true self and maximizing it could make you the next Bill Gate, Aliko Dangote, Genevieve Nnaji, Thomas Edison, Wright Brothers, Ben Carson, Okonji Iwela, Martin Luther, Nelson Mandela, John C Maxwell, Kenneth Hagin etc. So wash off the dirty words of men over you and wear your apparel of uniqueness. Never live bitter because someone or society wants you to, don’t live in mediocrity because someone or society wants you to and don’t live small because someone or society wants you to. Discover your true self and live it. Blossom! You are too special, too unique!!! I am Glorious (GreatGlorious) Wilberforce, from Yenagoa, Bayelsa State. Graduate of English and literary studies from Niger Delta University; Assistant Public Relations Officer, Bayelsa State Council for Arts and Culture; a God class writer of quotes, articles, poems, novels and short stories. I am a lover of the gospel of Christ and I’m passionate about youth capacity building and development.